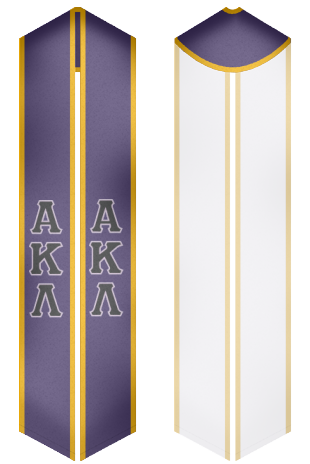 Custom Sash Buy the best Alpha Kappa Lambda graduation stoles and sashes. Alpha Kappa Lambda is a fraternity for men founded at the University of California, Berkeley in 1914. The fraternity has 33 active chapters and has been known for its philanthropy. Members take great pride in wearing their fraternity coat of arms and the fraternity is host to various famous alumni. The fraternity prides itself with helping Christian men achieve a valuable social standing and urges them to help their brothers in fraternity. We offer to make your graduation very special for you and your loved ones. By wearing our custom made and high quality sashes not only do you make your graduation memorable but you also give yourself a chance to boast what fraternity you belong to.